We are a non-smoking establishment, although we do provide smoking areas on our decks. Since smoking is not allowed in the house (even at open windows) there is a $100.00 cleaning charge if anyone smokes in a room. 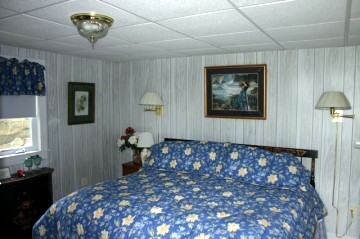 Our rates are based on double occupancy per room. Any additional adult is $25.00. Each child under 10 in a room is $15.00. Pets are $10.00 (each/ Night). 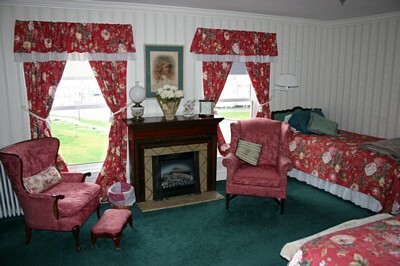 Room rates do not include the Maine State Lodging tax of 8% or any gratuities. There is a one night or 1/2 of your stay deposit required on all rooms at the time of your reservation. The deposit is applied to the last night (or nights) of your stay and you are responsible for the beginning portion. We do not accept cancellations on a portion of your stay. Because we are so extremely busy, we do require a month's notice for cancellations even in the off season. 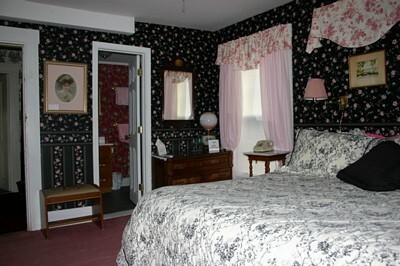 There is a $25.00 charge per room per cancellation. During peak season, due to the extremely high demand for rooms, especially on camp parent's visitations, we are taking only 2 or more night minimum reservations with the full amount of the stay due at the time of reservation. Deposits must be received by check within 20 days or the room will not be held. Please verify both the dates listed and the number of people scheduled are correct and notify us of any change needed. Because of fire codes, any extra person or persons beyond confirmed original number will not be allowed as most rooms cannot accommodate them. There will be no refunds for early departures or cancellations once the reservations are confirmed. No refund is given if cancellation is shorter than the required time. No refund is given for early departures. No Transfers! We do accept children but ask that they be quiet and well behaved. Children must also be accompanied by an adult at all times and may not be left in a room alone at any time. Please inquire about bringing children, as all rooms will not accommodate them. We are not responsible for items left in room. Please check your room thoroughly for personal items before leaving as there is a charge of $10.00 plus postage for all returned packages. We accept Master card, Visa, Diners Club, DIscover, Traveler's Checks or Personal Checks. Discounts are available for stays longer than two nights (off season). To allow our staff to prepare for you, check in only after 3 PM and before 8PM please. Check out is 11AM. A small resident dog lives in owner quarters only. Our peak season is May 1st through October 30th and our off season is November 1st through April 30th. We reserve the right to request a two (2) night minimum during "in Season", holidays or special occasions. *Gift Certificates are also available. Enjoy a full, HOMEMADE BREAKFAST which includes fresh fruit or fruit compote, fresh muffins and breads, cereal, juice, coffee and tea, as well as a cooked main dish such as french toast with ham, or pancakes with sausage, served with homemade blueberry or apple walnut syrup. Breakfast is served between 7:30am and 9:30am. We are centrally located and within walking distance to the causeway, restaurants, recreation areas and shops. Enjoy great skiing at Sunday River in Bethel or Shawnee Peak in Bridgton. 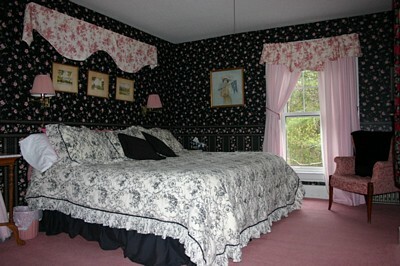 Quaint, romantic, secluded, this getaway is the perfect place to unwind. Feast your eyes on the most beautiful fall foliage in the world. With over thirty lakes in the surrounding Lake Region, the area boasts excellent fishing, boating, and swimming. If you prefer solid ground under your feet, we offer an unlimited number of hiking trails and a selection of fine golf courses to test your skills, as well as many other exciting outdoor recreational activities from which to plan your spring, summer or fall or winter vacation. Enjoy the many quaint villages Naples, Fryeburg, home of the famous Fryeburg Fair held yearly in October, Bridgton, home of Bridgton Academy, as well as Sebago Lake all with a charm of their own. Experience life the way it use to be and the way it should be. Experience Western Maine. The Songo River Queen is an honest-to-goodness replica of the famed Mississippi River Stern Paddle Wheelers. Travel the Songo River on a two-hour cruise through historic locks, or take a shorter cruise on Long Lake. Bison in Maine…yes we do..visit Beech Hill Bison Farm, take a wagon ride through the pastures and hand feed the animals. Gallery302 is Western Maine’s Newest Fine Art Gallery, a must stop location for anyone happening to be in the Lakes Region area any time of the year! Love horse back riding? What a beautiful way to see the Maine countryside. Secret Stables has trail rides and lessons. The beautiful Olde Mill Tavern in Harrison is a great place for dinner. You can choose from: authentic West Coast Mexican, Coastal Fresh Seafood, Wood Fire Grilled as well as baked selections and home-styled chowders, stews, soups and assorted breads, baked on the premises. Relax in a rustic environment, graced with an 18th-19th century history. Discover beautiful Deertrees Theater in Harrison. Listed on Maine’s State Register of Historic Landmarks and on the National Registry of Historic Places the theatre is being run as non-profit performing arts center presenting almost fifty productions during a season that runs from late June to early September. 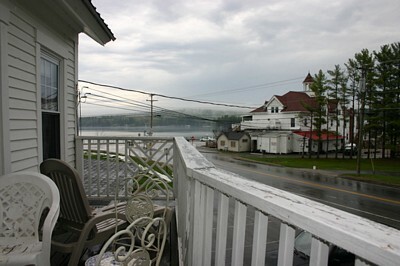 Spend the day on the beautiful lakes in the Western Lakes Region of Maine! Sebago Sailing in the only Maine Sailboat Yacht Charter Service and ASA Certified Sailing School on the Lakes in the State of Maine and we are proud to serve your sailing needs. Remember to visit the Fryeburg Fair, Maine's largest agricultural fair held the first week of OctoberYou've come to the right area if you love winter activities. Ski enthusiasts will find many excellent facilities for both nordic and alpine skiing. Downhill skiing at Shawnee Peak, Sunday River, and Mt. Abram are only a short drive from the inn. We offer discounted lift tickets for Shawnee Peak to our guests. For nordic ski enthusiasts (as well as sno-shoe hikers), a half dozen locations await you as close as our backyard with over 100 acres of lawns, fields and forest surrounding the inn it's a perfect place to X-country ski. Snowmobiling, skating and ice fishing are also popular wintertime activities in the area. Maine boast of having over 600 miles of groomed snowmobile trails and it is less than a mile to one of our favorite snowmobile trail links. We can arrange for sled rentals delivered to our inn. Our own back yard is perfect if you're looking for a relaxing get-away summer, spring or fall. Listen to the rippling waters of Bear River as you relax along its banks. Unwind with a good book on our covered deck or in our gardens after a busy day of activities. Truly a four seasons area, the Lake Region boasts many fine restaurants, stores and antique shops. Take a day trip to Freeport or North Conway (tax-free shopping! ), explore the Grafton Notch area, travel the scenic Kangamangus Highway, hike in the White Mountains, drive up Mount Washington, enjoy the hustle and bustle of Portland's Old Port, or view the spectacular coast line at Pemiquid Point. All this, plus more is within an hour's drivefrom our inn. 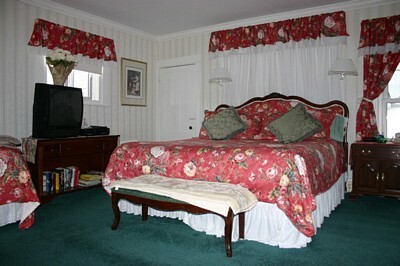 Our guest rooms, with elegant, yet homey furnishings, feature queen, twin and king size beds. 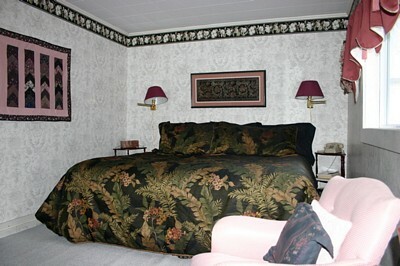 Each unique room has been tastefully decorated for your enjoyment. 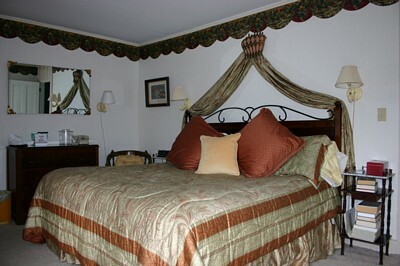 All rooms feature modern private baths and robes are furnished. 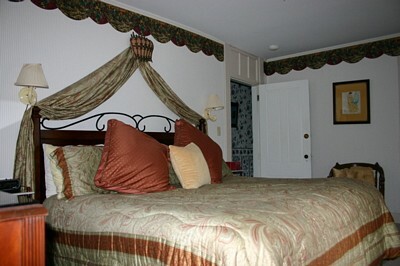 Rooms have Air Conditioning/Heat, TV, Phones, we also have Wireless Internet Access available for our guests. 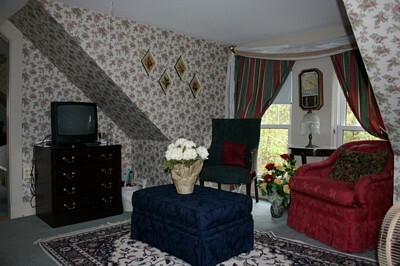 We also have a New 2 Bedroom Unit - full kitchen, living room, bath, TV, AC, deck, fully furnished. Blue Room : Our Blue Room is located on the 3rd floor, has great views of the Causeway and Long Lake in Naples and features Flat Screen TV, private bath and a sitting area. Black and Pink Room : Located on the second floor this room is very spacious and offers a private bath, Cable ,a flat screen TV, and has a very romatic ambience. King Room : Made for a King. 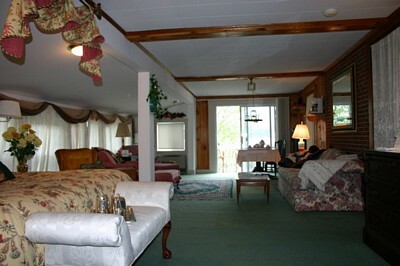 Features a King size Bed, fireplace, sitting area, Cable TV, and a view of the Causeway and Lake in Naples. Yellow Room: A beautiful room with all the amenities. 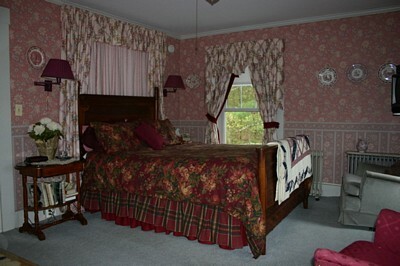 Private bath, Flat Screen TV, top quality linens, and great antiques decorate this stunning room that also has a deck. Blue Room: Great room with a nice deck attached. 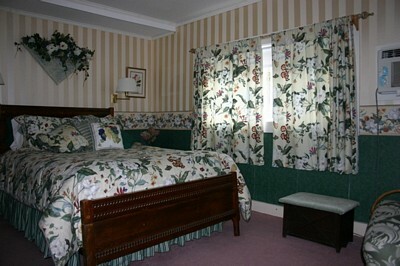 This room has a private bath, top quality linens and beautiful furnishings. 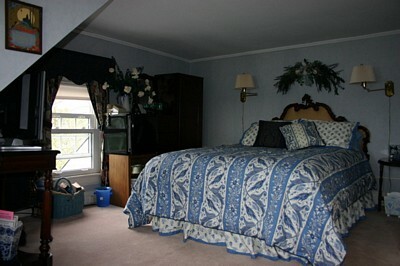 Equipped with a flat screen TV, and all amenities, this room is a must see and stay.. 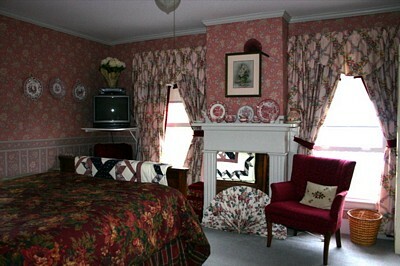 Pink Room: Very quiet and cozy room with great ambience and tranquility. This room is a nice retreat from the busy out door activities of the Naples area. Green Room: A nice private room located away from the main inn, this room offers privacy, private bath, Cable TV, and all other amenities. 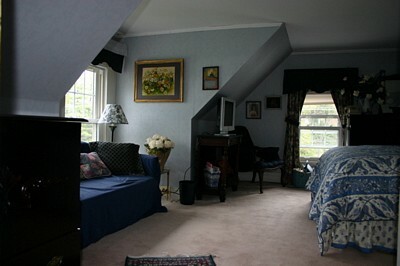 Two Room Suite 3rd Floor: This private suite is perfect to getaway from the rest of the world. 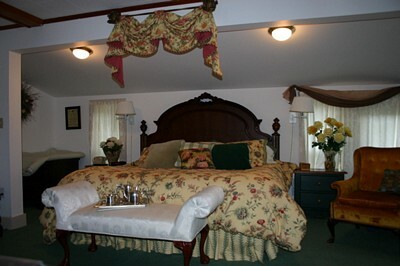 Very warm and cozy, this private 2 room suite offers a sitting area, private bath, private bed room, and views. 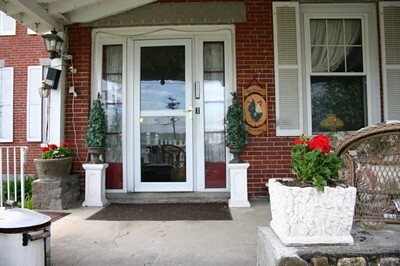 At the Augustus Bove House we also have 2 cottages for Rent. 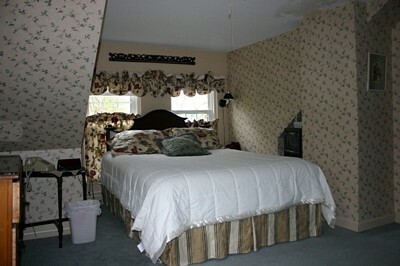 Our large Cottage, located behind the Inn has 2 living rooms, a full kitchen, two bedrooms, and full Bathroom, all the amenities of home and can sleep 6. Also available with the cottage is a Gas grill, and patio furniture. 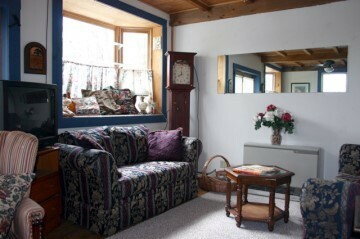 Our Small Cottage is situated behind the Main Inn and sleeps 2, has a full bath, private deck and all the amenities of home. Also available with the cottage is a Gas Grill, and Patio Furniture for your enjoyment.